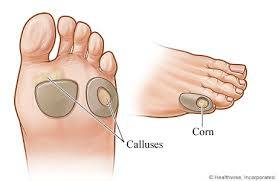 Corns and calluses are a common foot complaint that affects many people. They are a build-up of thickened skin (hyperkeratosis) that can occur on the tops of your toes or on the soles of your feet. They form as a result of friction and pressure either by footwear or foot biomechanics. Callus or thickened skin will form initially as protection from the friction and pressure but can become painful as the skin has loses suppleness and elasticity. The corn will be a particular centrepoint of pressure and will form underneath the callus. This can be quite painful as it presses against the inner layers of skin and closer to nerve endings. At Podiatry HQ we have a number of treatments to manage your corns and calluses. The most common method will be for our trained podiatrists to remove the callus with appropriate podiatric equipment ensuring that the callus is removed and a return to suppleness of skin occurs. Corns will also be managed in a similar way, with the podiatrist taking appropriate time and care to ensure the centrepoint or nucleus of skin has been removed. Once this treatment is performed there is often immediate relief for the sufferer from their corn. Appropriate podiatric equipment will also be used to smooth over the callus and corns to enable a smoother transition from affected areas to regular skin. Our podiatrists will also conduct footwear and bio-mechanical assessments to determine causative factors for your corns and calluses and recommended appropriate treatment plans such as timeframes for ongoing treatment, footwear, orthotics/insoles and padding devices.